Alcohol inks are brightly colored dyes, dissolved in an alcohol carrier. They also have other ingredients such as a thickener that’s similar to glycerin, that gives the ink better flow qualities than pure alcohol. They come in small plastic dropper bottles, typically 0.5 ounces (15 ml), in a range of colors. The most popular brands are Piñata, which comes in 19 colors, and Ranger, which comes in 59 colors. There are many other brands, however, as these are a common arts and crafts material used in making many types of art. What Are the Properties of Alcohol Ink? Although I’m going to focus on how we use alcohol inks with polymer clay, it is helpful to understand their basic properties. Alcohol inks are a dye. (You can learn about the difference between pigments and dyes in my article here.) Saturated inks are deeply colored, containing lots of dyeing power. Less saturated inks are more dilute and have less dye in each drop. You need less of a saturated ink to color something, but you may need to dilute (thin) it to keep from over whelming your project. Piñata brand inks are generally more saturated than Ranger inks. Also, within the Ranger line, there are some colors that have very similar hues, but the difference is that one is highly saturated and one is more dilute. Dyes do not block light in the way a pigment does, so alcohol inks will always give translucent coverage when painted onto a surface. Because of this quality, they work nicely to tint translucent clay, such as when you make faux glass. (Learn five faux glass projects in my tutorial here.) The white and the metallic colors of alcohol inks are a bit different because they do contain pigments, and so they do have more coverage. These faux Czech glass beads (yes, made from polymer clay!) were made using the Faux Glass Effects Tutorial. Once dried, alcohol inks are waterproof and cannot be washed off a surface with water. They can, however, be dissolved by using alcohol, even after they dry. Alcohol inks will permanently stain porous or stainable surface such as paper, fabric, wood, skin, or even some colors and brands of baked polymer clay. The color cannot be fully removed from these surfaces because the dye has actually stained them. You can, however, easily remove alcohol ink colors from non-staining surfaces such as glass, glazed ceramic tiles, and some plastics. You do not need to heat set alcohol inks and they will not become “more permanent” if you heat them. As with many dyes and pigments, alcohol inks are not lightfast. This means they may fade over time when exposed to sunlight or even some types of indoor lighting. Not all colors will fade, and it’s rather difficult to predict which ones will. Because alcohol has such a low surface tension, drops of alcohol ink tend to repel one another while wet. This makes for very interesting and rather unpredictable color patterns as the wet ink swirls and dances around on the surface of your project. This is part of the appeal of this fun material. Each bottle appears as one color, but may consist of several dyes. These component colors can sometimes separate or interact with the clay in interesting ways. They may also fade individually, making a green ink turn yellow as the blue component dye fades. Other colors may look one way on paper but turn to a different color on polymer clay. For example, red will usually appear as either orange or hot pink when used on unbaked polymer clay. Because alcohol ink contains thickeners similar to glycerin, they can leave a surface feeling sticky if they’re applied too thickly. This doesn’t make the clay itself sticky, though, and you can remove the excess ink. Piñata inks are more likely to do this than Ranger inks. How is Alcohol Ink Used? As I said before, artists use alcohol ink in many arts and crafts. They’re used on paper, ceramic tiles, glass, metal, plastic, and on a special plastic “paper” called Yupo. You can use them as a primary art medium and create designs with alcohol inks alone. Or you can use alcohol ink to add color to other materials. I’ve used alcohol inks to color metal findings and wire, change the color of a bead, dye silk ribbon, decorate a switchplate cover, and add color to faded Christmas ornaments. The possibilities are truly endless. “Emerging” Ink Blot Pendant that I made with alcohol ink on the back side of a glass tile. Because alcohol inks are not pigments, they create a translucent wash of color over the surface of an item. You can alter the color without the details, texture, and shading of your project being obscured. The effect is subtle or it is quite striking, depending on the colors chosen and the way it’s applied. For examples of how you can use alcohol inks in general crafts, have a look at this great page from The Enchanted Gallery. Because polymer clay is quite unlike other materials, we do use alcohol ink with polymer clay in unique ways that paper or mixed media artists aren’t familiar with. And paper or mixed media techniques that you read about or see on YouTube may not work well when applied to polymer clay. Always experiment and test a process before using it on a large project. Keep in mind, also, that different brands of polymer clay may react differently to alcohol inks. When using alcohol inks with polymer clay, consider that you can mix it into the clay, apply it to the unbaked clay, or paint it onto baked polymer clay. Instead of applying alcohol ink to the surface as with most other crafts, you can actually mix alcohol inks into polymer clay. I’ve written about this process in detail in my article Coloring Translucent Polymer with Alcohol Inks. You can use any color of polymer clay, but remember that the ink’s color will compete with the existing clay color. This means that it takes a lot of ink to change the color of red clay. And white clay will always be a pastel no matter how much ink you use. But tinting translucent polymer clay with alcohol inks is super fun because of the bright, clear, glass-like colors that you can make. 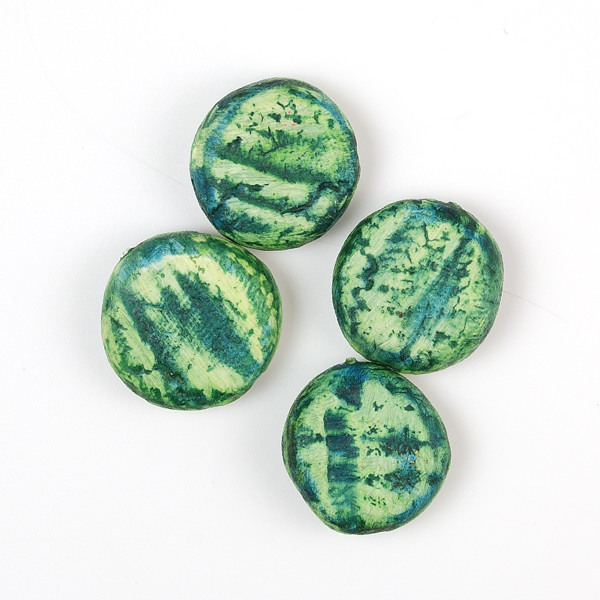 You can use alcohol inks to tint translucent polymer clay to create glass-like beads like these. You can learn this process in the Faux Lampwork Tutorial. When mixing alcohol inks into unbaked polymer clay, it’s best to apply the ink to a sheet of raw clay and let the ink dry before you try to mix it. It’s not strictly necessary, but it sure makes mixing a lot less messy! Alcohol does thin and soften the polymer clay, so do be aware that if you add very much alcohol ink, the clay can become too soft and/or sticky to work. It’s always better to add smaller amounts and then add more if you are sure it needs more. You can also tint liquid polymer clay with alcohol inks to make a tinted, translucent glaze. Some colors of alcohol ink will change color if you bake them at a high temperature. This is normal. Some colors do break down in the heat of baking and can give unpredictable results. Doing test bakes is always advisable if you have an important project to complete. This factor is also the reason you can’t make reliable color charts and color recipes with this process. When you tint polymer clay with alcohol ink, the color will not come off and you cannot remove the color with alcohol. It is locked into the clay mass. Some colors will fade with exposure to sunlight, even though they’re baked into the clay, but this takes a long time to happen. There’s one more point I want to make. Dyes can sometimes bleed through baked polymer clay over time. I don’t see it happening consistently, but just as a Sharpie can bleed into plastic over years, sometimes a component color of alcohol ink can do this. It does happen. Alcohol inks are great fun, but we do need to remember they are not archival materials and they aren’t really realistic for creating family heirlooms to pass down. Once you bake the project, the colors lock into the clay itself and become permanent. You cannot remove the color pattern from the clay’s surface. Generally, alcohol ink applied in this way will not rub off the surface of the clay after baking unless it was thickly applied and excess ink remains. You can use alcohol inks to color the surface of unbaked polymer clay as with this ornament made using my Opulent Tapestry Tutorial. Alcohol applied to the surface of unbaked polymer clay can cause changes in the clay’s texture. Alcohol dissolves polymer clay and this can sometimes be a factor. I’ve also noticed that repeated application of alcohol to the surface of unbaked polymer clay can sometimes cause it to become less supple and possibly crack when flexed. Unbaked polymer clay is not a solid, it’s more like a really firm gel. So when you apply alcohol ink to raw clay, it will eventually diffuse through the clay mass. This means that you should bake your alcohol ink designs right away. If you leave the clay to sit, you’ll notice that the designs soften and blur over time. You can notice this effect happening in as short as a few hours. You can’t store veneers made with alcohol inks because the ink will blur and eventually disappear into the clay. To use alcohol inks on baked polymer clay, just apply as desired with a small brush. Because alcohol inks are quite sheer, the ink will not cover thickly like a paint. Rather, the details and textures of the clay itself will remain completely visible. Alcohol ink does not behave like a paint. Alcohol ink is its own thing! It works well as an accent or to subtly tint an area or element. It is not a substitute for paint, so it won’t give a thick, even coating over an entire area. You can use alcohol inks to color and stain baked polymer clay to give unique and interesting effects. Once dried, alcohol ink on baked polymer clay is waterproof, but not alcohol proof. The ink stains the surface of the polymer clay in most cases and cannot be rubbed off. But some ink colors might not fully stain some brands or colors of polymer clay and can be rubbed off over time. Alcohol ink does not need to be heat set and does not become more permanent by baking the clay again after application. As previously mentioned, thick coats of alcohol might leave a sticky residue from the thickener in the ink. Alcohol ink has some really fun working characteristics, though, that make it unlike any other art material. On baked clay, you can get lovely color effects as seen in this very informative video by Patricia Roberts-Thompson. What About Sealing Alcohol Inks? Is it Necessary? Remember that polymer clay itself never needs to be sealed because it becomes a durable vinyl plastic solid after baking. But sometimes you want to protect surface treatments from wear and tear. Alcohol ink, once dried, is naturally waterproof and will not run when it gets wet. Alcohol ink has another factor to consider, though. If the dye is dissolved by the solvents in hair spray, bug spray, sunscreen, cleaning products, or hand sanitizer, the color can transfer to clothing or skin and make an awful mess. You can use a sealer to create a barrier between the ink and the world. Once an item is baked, any alcohol ink mixed into clay or applied to unbaked polymer clay does not need sealing. Varnishes can intensify the color, of course, but sealing is not required to protect the alcohol ink or to protect us from the ink. Solvents cannot dissolve the color that was applied to (or mixed in with) polymer clay and then baked. If you apply the ink too thickly to unbaked clay, you might still want to seal it in case any unbound ink remains on the surface. You don’t need to seal alcohol ink applied to the surface of baked clay if it will just be kept on a shelf. But if the item will be handled, you really should use some sort of sealer to protect the ink from being dissolved by solvents and protect skin and surfaces from being stained by dissolved ink. What Sealer Should You Use? There are lots of ways to create a clear barrier on the surface of polymer clay. This helps keep the ink from rubbing off or from being dissolved by household solvents or cosmetics. For a review of the various types of products to use, check out my article Understanding Glaze, Sealer, and Varnish on Polymer Clay. Here is more about each type of sealer as it pertains to using alcohol ink on polymer clay. Sprays and varnishes will usually also dissolve alcohol ink. This means you should apply them in thin coats and very quickly so they dry before they dissolve the ink. Remember that spray varnishes recommended for use on paper or wood will almost always never dry and will remain sticky on polymer clay. If you want to use a spray sealer, PYM II works well when lightly sprayed in thin coats. You can read my review of PYM II here and see how it works with alcohol ink. These thick gel coatings such as Triple Thick, Mod Podge Dimensional Magic, and Diamond Glaze will all cause alcohol ink to run. Do not use them to seal and protect alcohol inks. Renaissance Wax and paste wax, while really great products for enhancing the color and richness of a surface, will do nothing to seal and protect alcohol ink on polymer clay. In fact, they can also cause the ink to bleed and run if thickly applied. Liquid clay sometimes dissolves dried alcohol ink, causing it to run. If you’ll use liquid clay as a coating, do make sure that you use a thin coating and bake/cure it right away. Once the first coat cures, you can add more coats and build up a thicker surface. Curious about using liquid clays as a clearcoat? You can learn more about this process, and see which brands work well for this in my article on Comparing Brands of Liquid Clay. Just as when you dye your hair or work with any other stain or dye, be aware that alcohol ink can make a real mess of your clothing. Wear old clothes. You WILL spill it. And you WILL get it on your fingers. It comes off in a few days, but you might want to wear gloves if colorful hands are not your thing. Errant splashes and specks will ruin your work area, too, so make sure you’re not using the kitchen table. Alcohol dissolves alcohol ink and removes it from non-staining surfaces. Rubbing alcohol will work. That’s isopropyl alcohol to those of you outside the US. Read more about using this wonderful supply in my article about using rubbing alcohol with polymer clay crafts. You can use alcohol to thin and dilute your alcohol inks, too. I like to put alcohol in a small spray bottle to create special effects with the alcohol ink design. Use alcohol to clean your tools and work surface, and any brushes that you used. Remember that soap and water will not clean up alcohol ink! I like using a glazed ceramic tile or glass work surface because it can so easily be cleaned after I’m done working. Here’s a tip: Open your bottles of alcohol ink over a waste basket. The crumbles from dried ink can otherwise fall onto your clay project. They look black and you might not even notice them. But they will “bloom” on polymer clay or when they contact alcohol and can cause an unintended effect. Are there other art and craft materials that are similar to alcohol inks? Yes! Read on for some ideas of other materials that you can use. There’s even a way to make your own DIY alcohol inks. Alcohol markers such as the Spectrum Noir, Copic, Prismacolor, and Chameleon markers contain alcohol ink! The rules for using these great markers are the same as using alcohol inks. You can even use alcohol ink in empty markers to create your own alcohol markers. Some alcohol marker brands provide bottles of refill ink. These inks, being just alcohol inks, can be used in exactly the same way as alcohol inks. Spectrum Noir and Copic Various are two brands that area readily available. I’m sure there are others. If you’re looking for a specific color of alcohol ink and can’t find it, you might have better luck looking at the huge range of marker colors. Staz-On is a brand of solvent stamping pads. Both the pads and the re-inker bottles are used similarly to alcohol inks. I’m sure there are many more products from the scrapbooking world that fall into this category. Feel free to experiment and explore. Anytime a product mentions that it is a “solvent ink”, it’s the same as (or very similar to) alcohol inks. A bottle of alcohol ink will last a very long time because they are so concentrated. But if you want to buy a lot of colors at once, the cost can add up. Are there ways that you can make alcohol ink for a lower investment? Yes. In a nutshell, you can dissolve any dye (not hair dye) into isopropyl alcohol, add some glycerin, and put into a dropper bottle. Sometimes you’ll need to experiment, but that’s the fun of it! Some people have used RIT dye (a common brand of fabric dye in the US) to make alcohol inks. The problem with this is that each package of dye is as expensive as a bottle of alcohol ink. In my experiments, this doesn’t give very bright colors. Also, be aware that the resulting liquid will not stain polymer clay. It will merely lie on top of the clay. A better solution is to make your own DIY alcohol inks using Sharpies Markers. You can sometimes get large multi-packs of assorted colors on sale, making this cost-effective. Just cut open the Sharpie and put the “guts” into some alcohol. Here’s a really great video showing how to do this. Other brands besides Sharpie will work for this, too. It’s a much more involved process, but Cyndi Cogbill of Pawpaw Patch Productions has created a whole array of alcohol inks by using dyes that she’s created from natural materials such as flowers, bark, and roots. How’s that for being creative? Now go get some alcohol inks and get busy experimenting! Disclosure: Some of the Amazon links in this post are affiliate links which means they give me a tiny percentage if you do choose to buy something from them. However, please order from a supplier that makes sense for you in your location. As always you inform in an easy to understand way. Thanks, Ginger. There is another brand of alcohol inks that I have found to be far superior to the brands mentioned. They only come in a few colors, but it is possible to mix to get many more. Montana Black inks have a UV inhibitor. They can be used outdoors. I have done lots of testing and they have been the most lightfast for me. This post brought back memories that I must mention. I was working with polymer clay at the time I discovered Pantone Tria alcohol inks. I touched another brand of alcohol ink to the Pantone inks on a polymer clay postcard and saw a pattern emerge on its own. I had always said I would never be a painter, but that one accidental pattern piqued my interest. It took me several months to figure out what happened. Having been exposed to the polymer clay world in its online beginnings, I was into experimenting and trying anything and everything. Well, that is all history. Guess this is my love letter to polymer clay. I cannot give up polymer clay even though I rarely touch it. That one incident changed my entire art direction. I could easily write a book on what I have learned and know about alcohol inks and Resin and what they can do. And there is still so much to learn! But as everything changes and I move on, I now work more with acrylic inks and oils and try to push them in new directions. Still experimenting and loving it. All thanks to polymer clay and of course, my first polymer clay friend, Porro Sahlberg. Oh, the memories. P. S. You don’t have to publish all of this. Just had to write it. This is where I have purchased other colors. Ooh, very interesting! And what an odd choice for them to use BLACK as a brand name. Kind of like how Inka Gold isn’t just gold. Sigh. I might just have to invest in some of those. Geesh…my wallet is going to cry. But thank you for the info…always very good to learn more! In using alcohol inks on various surfaces, I found that some water-based sealers affect the inks, and not in a good way. Ranger’s Multi-Medium finishes do not mess up the inks. It’s a bit thicker than many sealers, but protects surface-applied inks very well. Yes, this is always the problem with using sealers. Every single one of them, even the good ones, run a risk of affecting the materials. Plastics are funny things, they interact in weird ways, and remember that both polymer and the varnishes we use are plastic! Wow, Ginger, another great article!!!! So much information and I went to the enchanted gallery site you mentioned – a great site. This article and that site are definitely keepers!!! Thank you Ginger, I have wanted to try alcohol inks for a while and you have given me lots of ideas and confidence to try. You make a great teacher. Thanks Karen. Go for it! Thanks for such an informative article! I’m a Blue Bottle fan and in fact, the first tutorial I ever bought, was one of yours! Thanks for another great article! Do you have any thoughts regarding colored India inks? Colored India inks are typically water based, pigmented inks. Depending on the brand, they can be more lightfast than dye inks. They can work nicely on polymer clay, but they’re very different from alcohol inks. As with most art materials, it’s always worth experimenting on polymer clay. Thanks Justine. As for the Faux Glass tutorial, have a look at the Customer Service page and see if that clears things up. If not, shoot me an email. Thanks! Wow, Ginger! What a great article. Full of interesting information and great tips and ideas. I especially like the bit about Paw Paw Patch. I had no idea there were any other inks than just Ranger and Pinata, so thanks for that too. Well, Cyndi’s colors aren’t for sale. They’re ones she’s made herself for her own art. But it’s an interesting thing to think about. I guess if it works for dying Easter eggs, why not alcohol inks? I hate to call Ginger a ‘know it all’, but yes, I think she is one…. esp. when it comes to polymer clay and what can be done to it! Great tips and even more to learn about alcohol inks. Thank you so much Erin! Keep me posted. I always enjoy seeing your work. Very interesting read as always. Regarding resin lifting inks sometimes, I wonder if it might be because the inks weren’t completely dry yet. I read a tip on a Facebook resin group that a spritz of rubbing alcohol pops bubbles in resin. I’ve found that this works very well for UV resin and 2 part resin. But for UV resin it works best if the alcohol evaporates completely before attempting to cure. If I get impatient and blast the surface many times with rubbing alcohol and shove it into my UV light right away, it never cures fully. But if I restrict myself to a couple of sprays and wait a bit for the alcohol to evaporate (which doesn’t really take long), then it’s all okay. I suppose it’s possible. But the inks are dissolved by a huge number of solvents, so I think it’s quite possible the resin is dissolving the ink. That’s very interesting about the alcohol…I never handle bubbles that way because rubbing alcohol contains water, which just seems to be a complication the resin doesn’t need. I’d blame the water more than the alcohol. Rubbing alcohol is 30% water when new, but with an older bottle the percentage will be higher as the alcohol evaporates and it is hygroscopic and will absorb moisture from the air as well. There’s nothing you can do to make them fade-proof. Dyes, by their very nature, are fugitive and not light-fast. Some colors are better than others. But all will eventually fade in sunlight. I don’t believe that PYM has any UV protection. But a coat of PYM will allow you to add another varnish on the top. Golden Polymer Varnish with UVLS does have a UV stabilizer in it, but I don’t know if this will actually be effective to keep the colors from fading. It’s one of those things that’s hard to test as it requires a long-term commitment. And by the time you know something, there’s no guarantee the products haven’t changed by that point. Have a question about trying to use alcohol inks on white clay and making a 2″ wide cuff bracelet. Do I make the bracelet first and bake it or use the inks on the raw clay and then bake it. Worried about using inks on raw clay and then curving it around a bracelet blank and baking it. Afraid the inks may show cracks. Any ideas on how to do this? Love all your articles and will keep coming back. Thanks. Alcohol inks can be used on raw or baked clay, but they will stay better and be more colorfast if applied to raw clay because they penetrate the clay and actually dye it. (After baking, they merely sit on the surface.) Yes, there might be some cracking as you bend the unbaked clay around a bracelet blank, but if this happens you can usually use a paintbrush and dab some ink onto the cracks, hiding them. Ginger, the alcohol ink gurus, recommend Krylon, Kamar spray varnish first (doesn’t react with AI), then a UV spray like PYMII. I’m not sure how Kamar will react to polymer clay, but it would be interesting to test. I use the Krylon UV spray, but haven’t tried on PC. I haven’t tested it, but I have tested about 15 other sprays and the results aren’t good. Most sprays remain sticky and never dry on polymer clay. It would certainly be simple enough to spray some on baked clay you have sitting around. Please have a look at my article on spray sealers and the one on testing sealers for specific spray sealers I’ve tested. Just FYI for anyone who might be interested…. Jacquard’s Pinata “Rich Gold” alcohol ink does not work on Premo polymer clay. I’ve tried it several times and it always turns the clay sticky…. or rather, the ink itself becomes sticky after a few days. It will dry initially but then becomes sticky as the clay interacts with it. This was disappointing to discover, as the Pinata Rich Gold is the nicest metallic gold paint I’ve ever used, and I’ve used a lot of them! Im planning to try Swellegant to seal some Premo thats been covered in alcohol ink. This Premo is in a bezel earring (plated metal). Will the Swellegent have an odd effect on the metal surrounding the patterned clay? Swellegant is a metal patina process that consists of several components: metallic paint, a patina solution, dye oxides, and a sealer. Each of these components will have a different effect when used alone (or in combination). I suspect you might be speaking of only the Swellegant sealer, itself, correct? If so, the sealer will have no effect on the metal bezel or the clay itself. It can, however, cause the alcohol ink to dissolve and bleed if you apply too much causing a long dry time. Swellegant sealer is very light-bodied and if applied quickly with a light touch will work nicely to coat alcohol ink on your polymer clay. Can I also ask whether the Gloss Swellegant Sealer is ok to use on alcohol ink & polymer clay ? Ive used the Matte Sealer and am hoping to enghance the appearance slightly with a light gloss without going to the extent of resin?